Distribution: Western pond turtles can be found throughout California west of the Cascade-Sierras from near sea level to 4,700 feet (1,400 meters). They are found in many of the Natomas Basin’s aquatic habitats, particularly in the larger irrigation and drainage canals, but their upland breeding habitat may be limited. Habitat Requirements: The western pond turtle inhabits a variety of aquatic habitats provided there is permanent, year-round water, some aquatic vegetation, adequate basking sites (vegetation mats, logs, debris, mud banks), and suitable upland habitat for egg laying. Reproduction and Demography: Western pond turtles do not reach reproductive maturity until about eight to twelve years of age. Females lay their eggs between March and August in nest sites dug at least four inches (ten centimeters) deep, covering the site with soil and vegetation. Nests can be found in various places from sandy banks to harder upland soil, provided the internal humidity of the covered nest site remains relatively high. Eggs can take up to 80 days to hatch, at which point the young turtles rest in the nest, absorbing the yolk sac until they are large enough to enter the water. Movement: The home range size of the male western pond turtle averages approximately 2.5 acres (1 hectare), while female and juvenile home ranges are much smaller. Females move overland up to 330 feet (100 meters) in the spring to find nest sites. The drying of ponds or other environmental triggers may also prompt overland movement. Western pond turtles are primarily active during the day, although some twilight and nighttime activity has been observed. 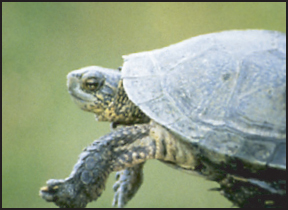 Provided temperatures remain suitable, western pond turtles remain active all year. 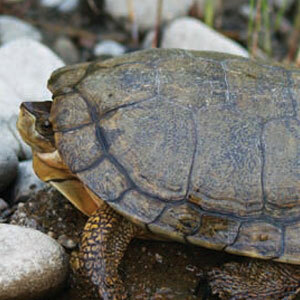 In cases of colder temperatures, western pond turtles hibernate in underwater mud. Ecological Relationships: Western pond turtles are opportunistic omnivores. Their regular diet includes invertebrates, fishes, amphibian eggs and young, and carrion. Western pond turtles must now compete with the nonnative red-eared slider (Trachemys scripta elegans). 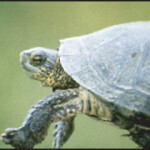 Wading birds, garter snakes, some mammals, and introduced fishes and bullfrogs prey upon hatchling pond turtles, and several mammals prey on nests.